Feeding plants isn’t very difficult. Most plants would survive without food. It is only for better growth and production of more fruit and flowers that feeding becomes an important issue. 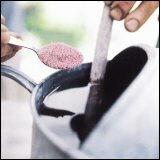 Good soil preparation will go a long way towards ensuring your plants have enough nutrients. Plants growing in soil that has had a large amount of organic manure dug into it for several years should not need extra feeding. However, the process of building up soil fertility can take a while to establish and in the meantime you may find it necessary to apply organic or chemical fertilizers to aide crop growth. Most fruit, vegetables and herbs will benefit from an application of fertilizer feed at the beginning of the growing season, usually in late spring. Throughout the growing season look out for plants showing signs of a particular nutrient. With fruit trees, wait until they reach flowering age before feeding and take care not to overfeed or you will promote leaf growth at the expense of fruit yields. In order to discover where you can apply fertilizer to the soil around a fruit tree, measure from the trunk to the full reach of the branches. Then draw a circle round the tree to this dimension. The roots of the tree will be within this circle, which means this is exactly where your fertilizer ought to be applied. 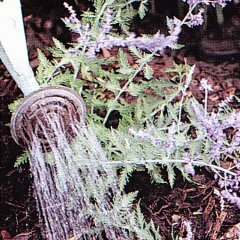 Watering plants is a fairly simple process. Most plants have the tendency to survive in extreme situations with either too little or too much water for a few days. The amount of water your plants require depends upon weather and soil conditions, as well as the health of the individual plant. Young plants and the seedlings need frequent light watering. Try to ensure that they get a good soak every few days - once plants are mature, frequent light watering simply encourages their roots to stay near the surface rather than growing deep down into the ground. and in terms of watering when their flowers appear when the fruits and pods are growing.